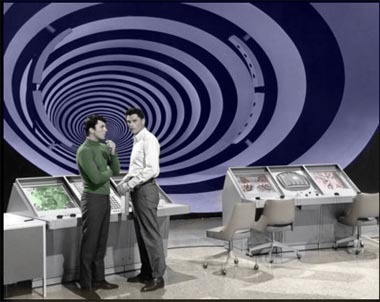 James Darren (left) and Robert Colbert (right) stand in the control room of the Time Tunnel in this publicity still from the 60's TV series. (7/07) I have to admit I am reaching that age where I spend too much time thinking about the things of my long-gone youth. One of the items I wind up thinking a lot about is TV from the 60's. I was a huge Star Trek fan, and still am, but that wasn't the only show on during the era. I really spend more time thinking about the science fiction shows produced by Irwin Allen during that period. For those of you not familiar with these gems, they included Lost in Space (remade in 1998 as a movie with William Hurt), Voyage to the Bottom of the Sea, and Land of the Giants. Irwin Allen productions tended to lean toward being camp instead of serious, which I think is part of the reason they never had the staying power of Star Trek. Still, they are remembered fondly by many people, including me. Readers will recall I did an article not too long ago about the B9 Builder Club, an organization dedicated to building full-sized replicas of the robot from Lost in Space. The fourth sci-fi show that Allen produced in the 60's was actually my personal favorite. (While doing some research I found out it was apparently Allen's favorite also) The program was called The Time Tunnel and starred James Darren and Robert Colbert as two scientists working on a super-secret U.S. government operation (named Project Tic-Toc) to build a time machine. The pilot episode sets the scene for the rest of the series: When a bigwig from Washington, D.C. arrives to shut down the billion-dollar project because of lack of progress, Darren's character decides to prove the contraption works by sending himself on an unauthorized trip back in time. Colbert's character is forced to go back also to rescue him. They spend the rest of the series jumping from time zone to time zone trying to survive until the crew back at the time tunnel complex can bring them safely home. The show had everything a 10-year-old could want, including a super-secret underground complex crowded with flashing computers. The series had everything a 10-year-old kid could want in a TV show: the mind-boggling idea of time travel, glimpses of past events (such as the siege of Troy and the Battle of Little Bighorn), and a humongous super-secret underground base in the middle of the Arizona desert. Most of all, it had the time tunnel itself: A psychedelic set of concentric rings that could only have been dreamed up by someone in the 60's. The tunnel was the focus of the action on the show and seemed to be the physical embodiment of a passageway to impossible adventures. About two years ago, the Time Tunnel series, which lasted only a single season, came out on DVD and I purchased a set and started watching it again. My only disappointment was that I really didn't have anybody to watch it with. 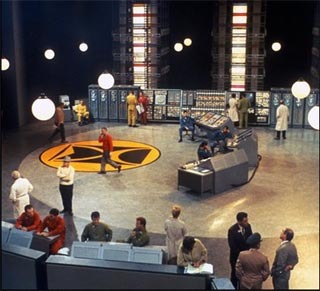 My wife - who does not share my enthusiasm for 60's science fiction - would sit through an episode with me only under duress. My sons, now well into their teenage years, were too sophisticated to want to watch the cheesy special effects from that era. So I was forced to savor these classic shows on my own. Or at least that was the case until last October, when I was in the middle of my teaching internship. As you can guess, I was a little bit older than most student teachers. I had decided a few years ago to change my career to something that might be more rewarding personally, though less rewarding financially. As I was working full-time during the transition it took several years, but by the autumn of 2006 I had entered my internship in a fourth grade class at a local elementary school. It was my job to teach the math and my co-op teacher challenged me to do something special with an upcoming unit on telling time. It consisted of five lessons which included such activities as teaching the kids to tell elapsed time on a calendar or an analog clock. For the most part the lessons didn't have to be in any particular order, so my co-op suggested it might be a good unit to use centers. 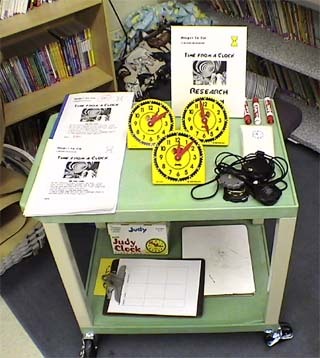 Using centers, for those of you not familiar with this educational arrangement, entails building multiple areas in the classroom where students can work independently from the teacher, either individually or in groups to learn a new skill. This made perfect sense to me. I could set up a center where the kids could work on learning how to calculate elapsed time on the calendar, another where they could do the same thing on a clock, etc. Five centers for five lessons. I could then divide the class into five groups and each group would go to a different center each day and work together till that had manged the skill. After five days they would have visited them all. It was all very educationally sound. However, to my mind it still seemed to be missing something: excitement. It was just too dull. I always try to enliven my units by doing something to catch the kid's interest. A giant map taped to the classroom floor for the unit on state geography. A simulated witch trial when studying 17th century Salem. What could I tie into my unit on time? One of the centers created for the unit. Then I remembered my Time Tunnel DVD. Once I made the connection, it didn't take long for me to figure out how to put it together. As I mentioned earlier, the pilot episode has Darren's character testing the machine and getting lost in time. My plan was to tell the kids our class had temporarily been made a part of Project Tic-Toc. I would then show them the episode up to the point where Darren's character disappears into the tunnel and then explain to them that we had been assigned the job of locating where in time he had gone, so that the time tunnel staff could then send him help. To find out where he had gone in time they would be working at the centers like scientists. At each center they would learn a skill (such as reading how many minutes after an hour the hand showed on an analog clock). They then would use that skill to decode a clue that gave one of five pieces of information necessary to figure out where the scientist was lost in time. By the end of five days they would have all the clues. They could then go to the computers at the back of the room, enter the date in Google and see what event had happened that day. When all the groups had done this we would then watch the remainder of the episode. My co-op appoved the idea and over the next couple weeks I put together my centers. In addition to materials to help them learn the new skill, each center had the clue to decode and some sort of game I invented based on the skill that would encourage them to practice it. To get them further involved in the storyline I created picture ID badges for each student on my home printer similar to those you might expect people to be wearing on a super-secret government project. The ID's bore imaginative titles such as Time Quanta Specialist and Nonspatial Linear Continuum Expert with a section saying that they each had a "Secret Clearance level of 17." The first day of the unit I borrowed the big screen projector from the library, hooked up my laptop and set the whole thing up in the middle of our classroom. It was my plan to give them a short power point presentation to set up the video, run the video, and then get them out to the centers before our math period ran out. 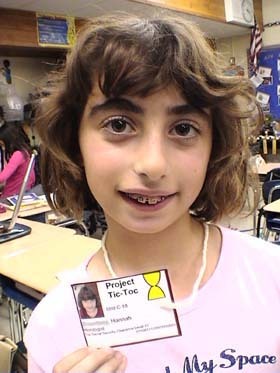 One of my fourth grade time scientists, Hannah, shows off her secret government identification. But I made the mistake of handing out the ID cards before doing anything else. These simple items made such an impact with the kids they were unable to think about anything else or follow any instructions I gave them for about ten minutes. They ran around showing the ID's to each other and peppering my co-op and me with questions like: "What are these for?" "What is Project Tic-Toc?" "Why am I a Horologist?" My co-op pointed out that perhaps next time I might want to issue the ID's after the power point, which would have answered many of their questions. Still, it was exciting to see the kids electrified by my whacky idea. I was particularly gratified to see that the ID's inspired one of our less academically inclined members of the class to run to the dictionary - a book he usually avoided - to find out the meaning of Chronometer Technician, the title on his identification. The kids eventually did calm down and I did get to do my power point and launch the video. The kids were enraptured with the episode and quite disappointed when I stopped it just after the scientist disappeared into the time machine. When I explained the assignment, however, they were excited with the idea of using clues to find where the scientist had gone and plunged eagerly into working at the centers. One little girl told me, "I like it because I felt like a real scientist." It was obvious some of the kids loved the idea of working on Project Tic-Toc, but I wasn't sure that interest in this idea extended to everybody. That was until one of the quieter kids in the class - one of the ones who I was afraid might be bored with the whole thing - showed up with a time machine she'd built over the weekend out of a cardboard box. The arrangement was quite clever. The box, which was decorated with crayoned dials and switches, was large enough for the kids to crawl through. The inventor then took them back in time by operating a dinosaur puppet from the outside. This kind of creative thinking was exactly what I hoped the unit would invoke in my students. The place the scientist lands is the Titanic on its maiden voyage in 1912. This was a lucky break as far as my unit went. The story of the Titanic had been featured in the language arts curriculum the year before and the students were very familiar with it. So much so that my original idea of having them enter the date in Google wasn't really necessary. Many of the kids realized where he must have gone just after seeing the date. Video Bonus: The trailer for the original Time Tunnel series. Was the unit really worth all that work I put into it? In the end I guess you could question if this elaborate arrangement was really necessary to teach the kids about using clocks and calendars. Certainly doing it straight from the book would have been easier and more efficient. Someone might argue the time tunnel was a useless distraction, a frivolous bit of entertainment, a silly science fiction show from the 60's about an impossible invention that could never work. I would argue, however, that the time tunnel actually did work. It was a true time machine: It bridged the decades and allowed a child of the 1960's to reach out and connect with some kids from the 21st century.